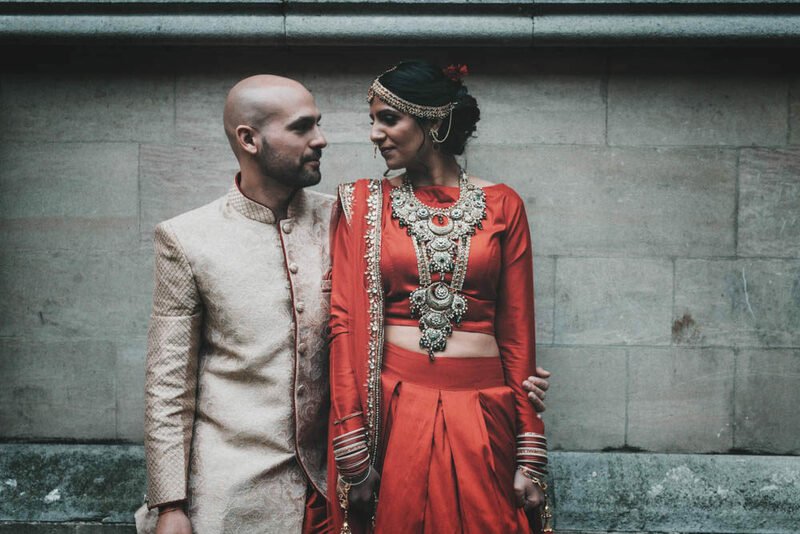 Simi and Jose’s wedding covers many days and many cultures, so I’ve included two galleries for you to enjoy. 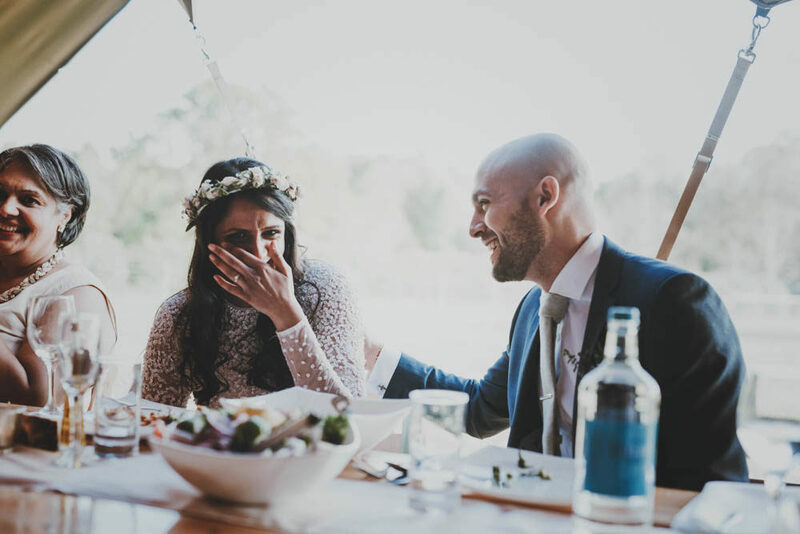 The couple held their traditional Indian wedding in London at Round Chapel, followed by a barn wedding complete with one seriously inviting and cosy tipi. The best bit about their weddings? 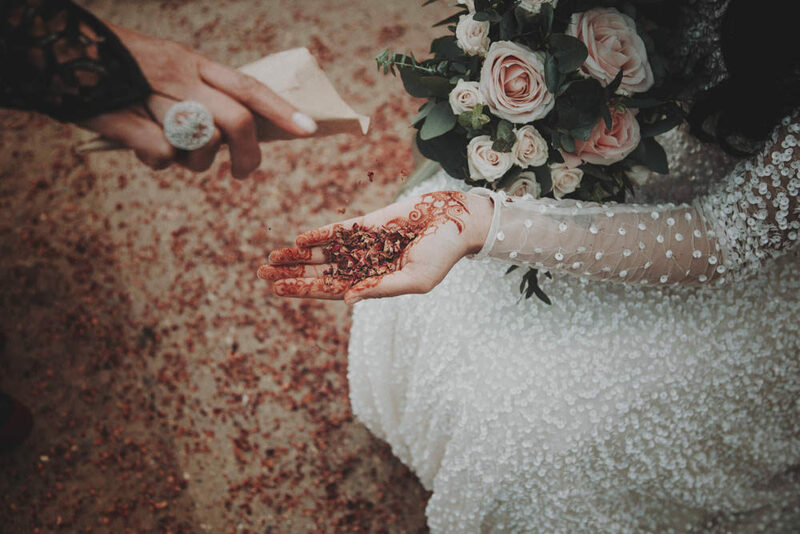 The pair chose exactly what they wanted to celebrate from their respective and joint cultures and combined them all to create two epic occasions. 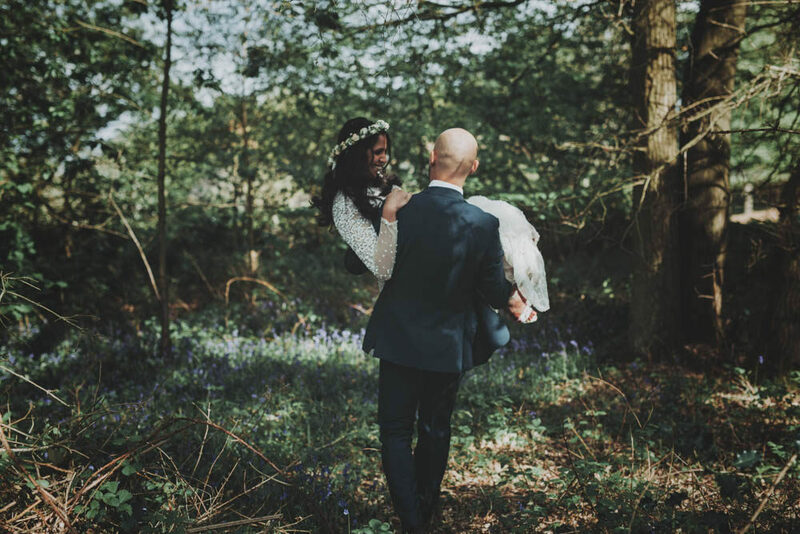 Images come from Meghan Lorna who has clearly worked her socks off to capture every special moment in it’s full glory. Jose is from Spain and has been living in London for the last 5 years. My family is Indian but we have lived in Africa up until about 15 years ago, when we moved to the UK. We didn’t have a religious ceremony but wanted to bring part of our cultures/traditions into the wedding. 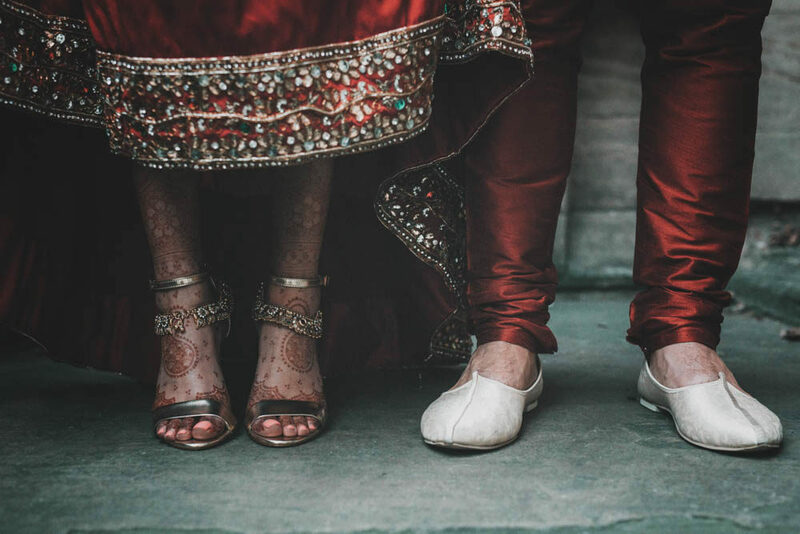 We had two events, one large Indian event for mostly my side of the family, and a smaller, more intimate wedding and reception. 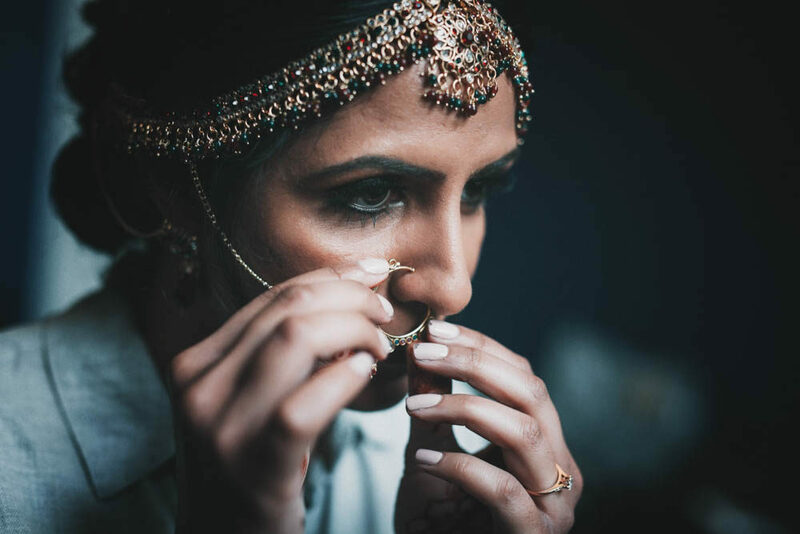 Simi the Bride: Jose and I didn’t have a traditional wedding, so I didn’t particularly want a traditional outfit (heavy embroidery and lots of bling). After spending way too long on Pinterest I decided all I wanted was a simple outfit and lots of heavy jewellery. I found the perfect set at a shop in Green Street, headset and nose-ring included! Luckily my aunt was also in India at the time and had my outfit made, with the embroidery stitched to match my jewellery. After feeling a little overwhelmed with all the choices available, incredibly we found an outfit for Jose in only the second shop we visited. It was quite simple with a vintage look, but he was comfortable in it and it matched my outfit perfectly. 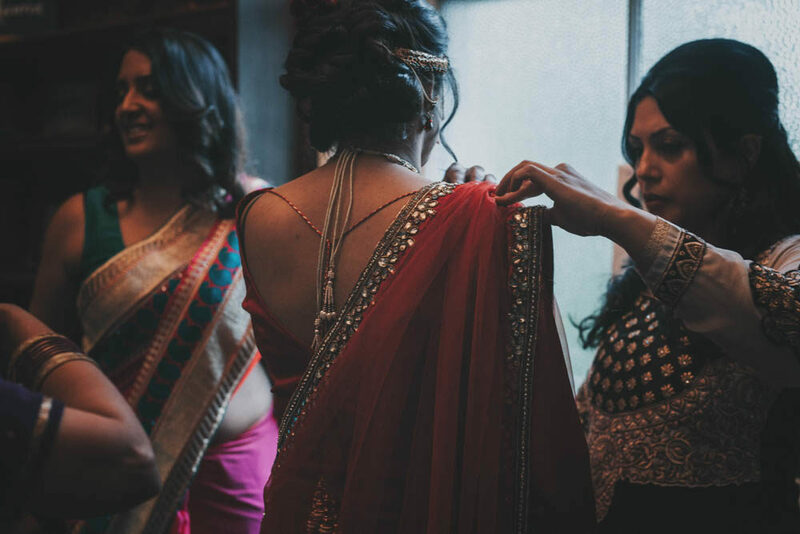 We actually combined three events into the one – the mehndi, ladies’ sangeet and jago. I had had my henna done the day before but we had the henna artist at the venue for everyone else. 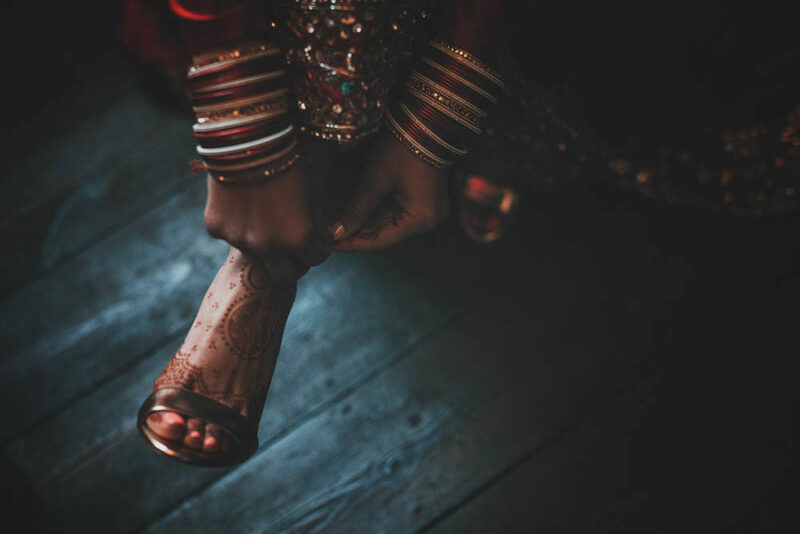 The ladies’ sangeet is a Punjabi tradition where the women sing wedding songs and tease the bride and groom. The jago involves dancing with a clay pot on your head, which is actually more fun than it sounds. The jago is the invitation for everyone to the join in the festivities. They did, in a big way. We were expecting over 200 people at this function and finding a venue in London large enough, as a dry hire, was difficult. We stumbled onto the Round Chapel’s website and were so taken by the venue- the high ceiling and original organ are really impressive. We picked colours that matched my outfit, dark reds and greens mostly. Pinterest is once again to blame for this. We’d started collecting lots of old books and decided we could use some for our centrepieces. That, along with some old tea cups and brass candle holders seemed to fit perfectly with the space. We’d ordered all the loose flowers from a local florist and spent the day before doing all the arrangements. Other than that, there wasn’t much needed by way of decoration, other than some fairy lights. We had a fantastic DJ for both the mehndi and the wedding. I’d asked Mand to pay some old Bollywood songs, classics from my dad’s generation, which was really nice. We had a buffet catered by a local caterer, Punjabi Lounge. The food was traditional Punjabi food with some of the dishes we’d find back home in Africa – spicy mogo. When we got engaged the first thing Jose and I agreed was that we wanted our wedding to be a little different. I really liked the idea of a barn wedding, but we couldn’t find one large enough. 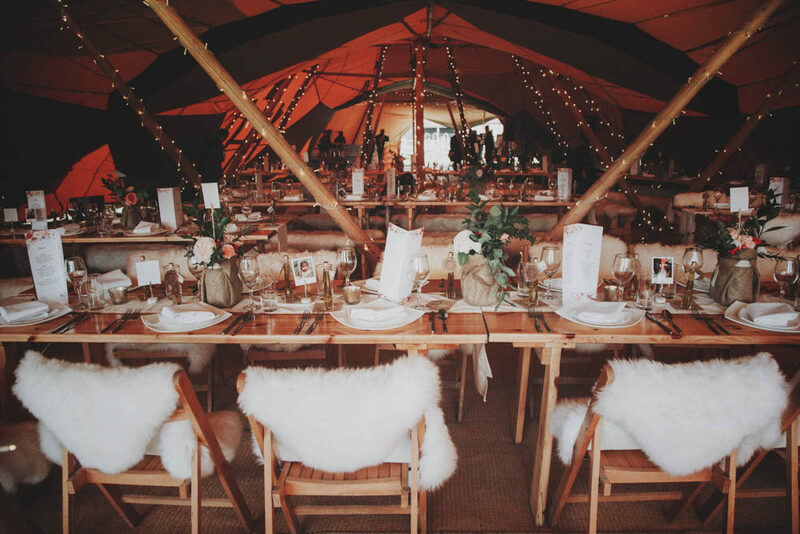 Then we’d come across a website hiring tipis, and there was no going back, we couldn’t accept anything else for our wedding. We hunted all over London and found Chiltern Open Air Museum, a museum dedicated to historic buildings. 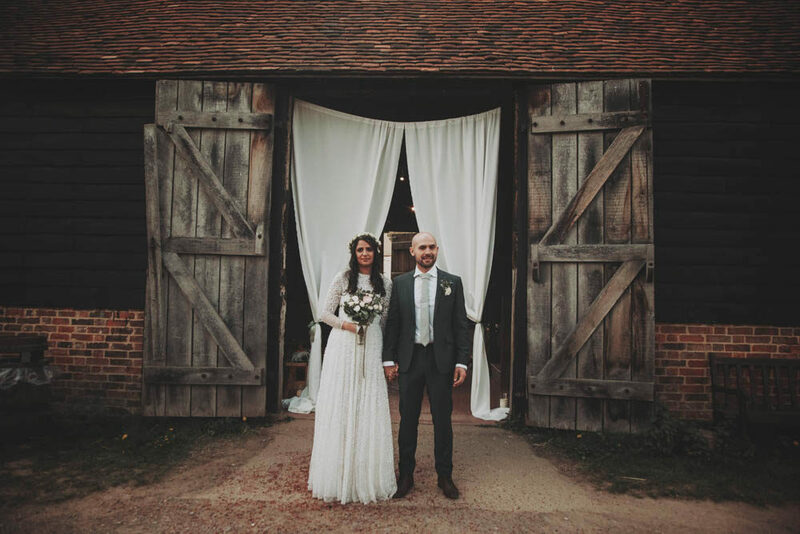 We had our dream wedding – the ceremony took place in the barn and the reception in the tipis behind the barn (except for when the DJ arrived and the barn turned into a rave). When in doubt, ASOS is my go-to shop. I had tried on a number of wedding dresses, but I couldn’t really see myself in a traditional white wedding dress. 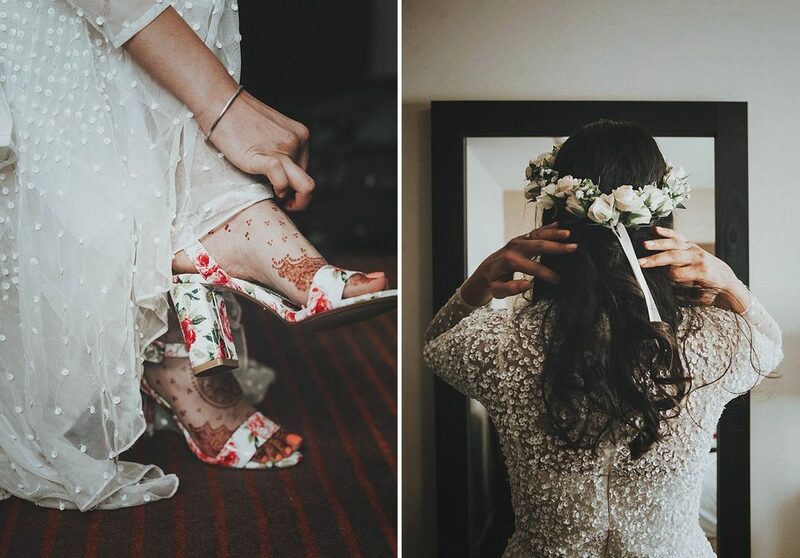 I’d found a bridal section on ASOS and after a few months of looking out, I found one that was perfect for me- simple, comfortable and a little different. Jose’s suit took a lot longer to find that mine (mostly because he wouldn’t let me help until we were running out of time). We were looking for the right shade of blue for the suit, with the right shade of green tie (because organising a wedding isn’t stressful enough). We discovered Richard James Mayfair, and after a few minor alterations, we were both really happy. We really wanted to keep it simple and natural, so pale greens mostly with pale pinks and whites. 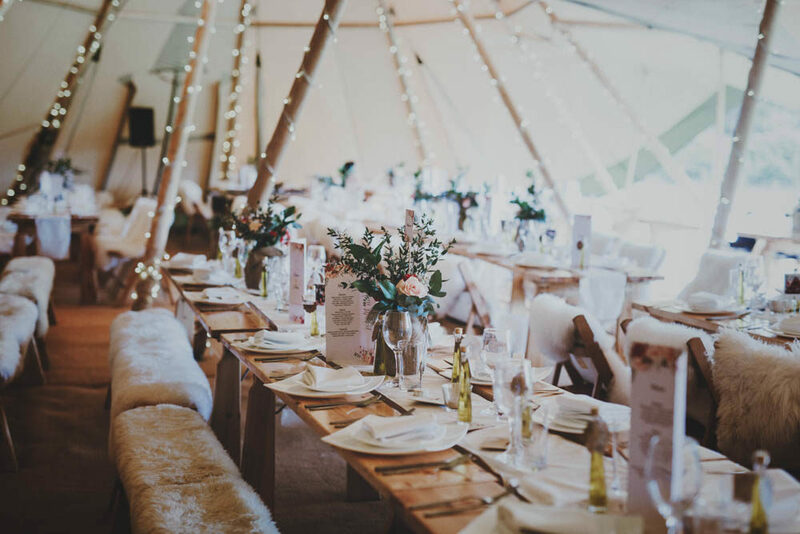 The tipi came ready covered in fairy lights, and that’s all that was really needed. 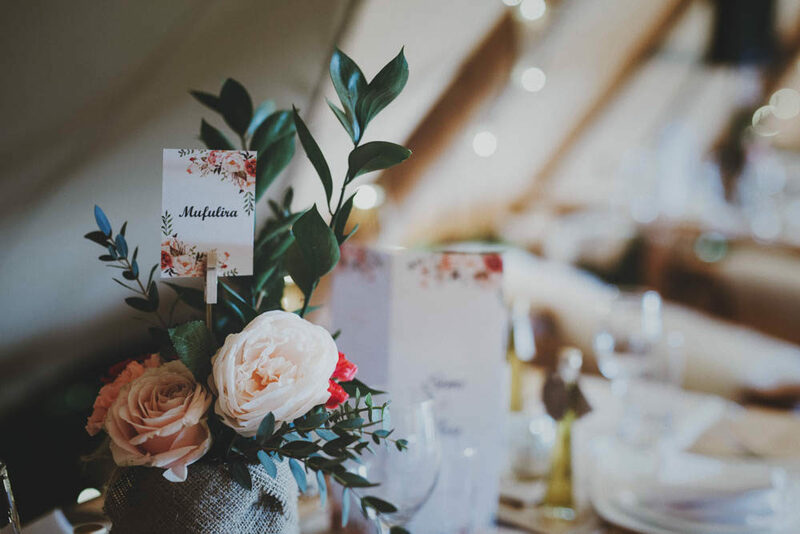 We had to DIY our centrepieces on a budget so I had collected lots of large coffee jars over the previous months and wrapped in burlap with a ribbon. We’d ordered the flowers from a local florist and went for a “rustic” (I’ve got no real skills in flower arranging) look. We’d made our wedding programmes into fortune tellers and used those for our place cards and each table had a polaroid picture of the guests (mostly from childhood). Petals also made my flower crown and bouquet to match based on the flowers we’d ordered from them. We had had our actual civil ceremony a few days before with just a few family members present, so at this was more of a blessing officiated by my cousin and Jose’s sister so that we had it in both English and Spanish. Jose decided to re-write our vows the night before so I ended up winging it during the actual ceremony as I couldn’t memorise what he’d sent me the morning of our wedding. It was pretty embarrassing but mostly just funny. During the ceremony and reception drinks we had an acoustic band playing traditional Spanish songs. It wasn’t long before everyone was on the dancefloor mid-reception drinks. During dinner we had a traditional bhangra performance by Nachda Sansaar. It was something different for our friends and family that had come from Spain, and again, it wasn’t long before my mother decided to join them and everyone was back on the dancefloor. We had a DJ in the barn after dinner. We’d given Mand a list of Spanish songs and he mixed these with English and Punjabi music really well. Once Meghan started throwing the glow sticks, the party was in full swing. We’d tried to combine both our cultures throughout the wedding, so naturally the food was a big part of it. We’d hired two caterers that worked together to provide a mix of Spanish and Indian canapés, starters and mains, which worked really well. And of course, I can’t forget our ham guy – the professional ham slicer than no Spanish wedding is complete without. We didn’t have a wedding cake, instead we had a dessert stand (my favourites, crème brulee and cheesecake) and a candy stand. I had found Meghan Lorna through Rock My Wedding and was really excited when we first met and she showed us more of her photos. Jose and I were really nervous about having our pictures taken but we’d had an engagement shoot with Meghan and Andy a few months before the wedding, it was really good fun and meant we weren’t nervous or (too) awkward on the day.